When Busby started her studies, she was undecided about what her major should be. However, in her first-year seminar class, Assistant Professor of Clinical Psychology Melissa Sisco encouraged Busby to take an independent study course. 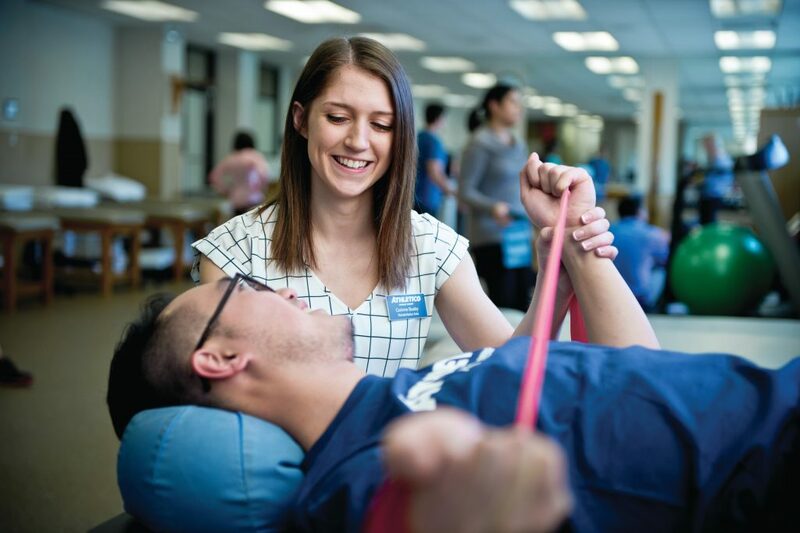 Busby decided to volunteer at the Rehabilitation Institute of Chicago as part of that course experience. At the same time, she was taking a biology class with Kelly Wentz-Hunter, associate professor of biology. The combination of her daily work at the Rehabilitation Institute and the classwork in biology made her realize that she wanted to pursue a career in physical therapy, so she decided to major in Biology. One experience that had a lasting effect on Busby was a class visit to a cadaver lab. The Roosevelt junior is currently employed as a part-time rehabilitation aide at Athletico, a physical therapy center located in Chicago’s East Bank Club. She is able to put what she learns in the classroom into practice every day as she walks clients through their rehab exercise programs. She reinforces her anatomy classwork by observing how the body works and how systems within the body relate to each other. She is able to put what she learns in the classroom into practice every day as she walks clients through their rehab exercise programs. She has particularly enjoyed classes with Wentz-Hunter and Norbert Cordeiro, associate professor of biology. About their teaching style, she states, “They love their job and what they teach. They keep you engaged in class. When someone loves something, it’s easier to learn from them and it makes you want to do your best.” Busby would like to participate in Cordeiro’s and Wentz- Hunter’s study-abroad class in which biology students travel to Tanzania to study conservation efforts, issues of poverty and the complexities of one of the world’s most important forests. During her freshman and sophomore years, Busby played basketball for the Roosevelt Lakers. She appreciated the team-building, communications and time management skills she learned while juggling a rigorous academic and athletic schedule. “My day planner was and is my best friend,” she said with a chuckle. With her biology studies, her job at Athletico and another job as a Roosevelt grader, she has little free time. When she does have a few moments to herself, she likes to spend time with her family, attending her high-school-aged brother’s games and playing with her nephew. She also appreciates the value of a good nap. Would you like to help a student like Corinne Busby? There are many ways to support Roosevelt students, including establishing a named scholarship. For information, visit roosevelt.edu/giving or call the Office of Institutional Advancement at (312) 341-4327. VeryimpressiveCorinne.keep up the good work!